12 Aug FORAGER’S REPORT – AUGUST 25-26, 2018 High elevation Boletes are up! High elevation Boletes are up! This past weekend we went camping in Burney Falls at the McArthur-Burney Falls Memorial State Park in Shasta County. 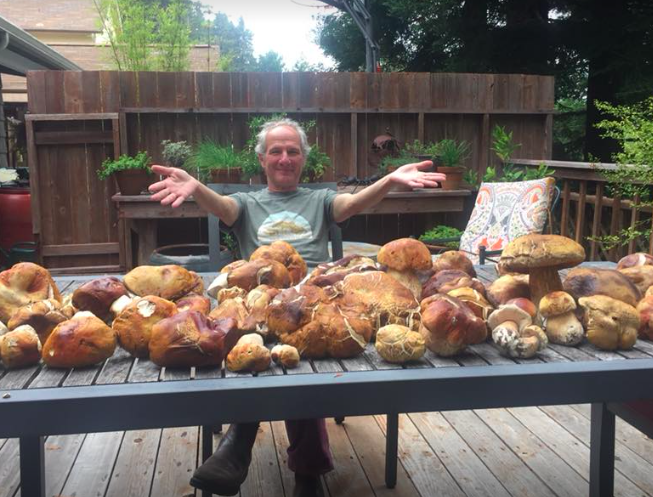 I have been keeping track of rainfall in the mountains north of Marin in order to reschedule the porcini foray we had to postpone and, although I did not see any precipitation in the forecast and the humidity was too low for mushroom formation, I was hoping against hope to find something….just anything. Thankfully the Falls are well worth the five hours spent on the road. The days were warm, the nights quite cool, there were hot-water showers, plenty of space between the well wooded sites, there were fishing and swimming and fun hikes. Camping there was delightful. The other side of the coin was that there was not a single mushroom, not even around the falls. Everything was bone dry. So much for the hunt. Kevin Sadlier, our past President and newly elected Vice-President also went foraging and found nil at Wrights Lake, Echo Summit and Virginia Lake. He did, however, find a good harvest in high elevations of Inyo National Forest. It had rained around the area so the porcinis were plentiful. The mushrooming season is just beginning and the future full of delightful expectations. Hope to see you in the woods!